Who would have known that seining fish could qualify as an extreme sport? Back then, we hadn’t even heard the term “extreme sport.” It was the mid-1970s, and I was a wildlife management student at Arkansas State University. The university had an aquaculture operation just off campus, and in the ponds there, a fish recently imported from Asia was being studied to determine its usefulness in controlling aquatic vegetation. That fish—the grass carp (Ctenopharyngodon idella)—roughed me up on more than one occasion. I was cut, conked and cudgeled by carp. But in the end, I got a weird sort of revenge. One of my professors suggested I could earn extra money by helping seine grass carp from the university ponds. Having seined a few catfish on east Arkansas catfish farms, I was game. So I signed up. For the life of me, I couldn’t imagine why baseball equipment would be needed to seine fish. So I inquired. “Why do I need baseball equipment to seine fish?” I asked. I complied, grabbed one end of the 50-foot seine and waded into the 1/2-acre pond. We then began pulling the seine through the water, and it became immediately apparent why the protective gear was needed. By day’s end, I’d been tagged by more than a dozen rocketing carp and had some nasty cuts and bruises on my arms and legs to show for it. During later seine hauls, when I was savvier to the ways of these piscean pugilists, I joined other part-time seiners in a daily game of “Catch the Flying Carp.” The object was to grab as many leaping carp as possible while pulling the net. The daily winner—the one who was able to bear-hug the most carp—was treated to a six-pack of beer. I bought more beer than I won, but when it was time to remove the carp permanently from the ponds, and we began playing “Hit a Home Run” with a baseball bat, I wound up with a pretty good batting average and lots of carp ribs to deep-fry for dinner. In case you don’t know, grass carp were introduced into the U.S. in 1963 when the Bureau of Sport Fisheries brought 70 fish from Malaysia to the Fish Farming Experiment Station at Stuttgart, Arkansas. White amurs, as they often are called, are native to larger east Asian rivers with Pacific drainages, including their namesake, the Amur River on the Chinese-Siberian border. Introductions have expanded their range to India, Europe, New Zealand and, according to some researchers, at least 40 U.S. states. The experimental imports did what they were brought here to do—eat excessive aquatic vegetation—and by the early 1970s, grass carp were being used to control weeds in public waters. These fish have a toothless mouth, but in the throat are two rows of large, comb-like teeth that grind the underwater salad they eat. One carp can eat two to three times its weight daily and may gain five to 10 pounds a year. Catching a grass carp on rod and reel is almost as fun as walloping one with a ball bat, thanks to this giant Asian minnow’s propensity for performing marlin impersonations. (Yes, the grass carp is a member of the minnow family—the largest, in fact.) When you target these vegetarians, however, they’ll shy away from “normal” baits like kids eyeballing a plate of liver and onions. You’ll hook more carp if you use plant parts for bait. Take cherry tomatoes, for example. These are grass carp baits par excellence. Impale one on a single, heavy-wire, No. 1 hook without a sinker, cast it, place your reel in free-spool so line plays out freely when a carp takes the bait and voila! You’re ready to catch carp. French fries are superb baits as well, and because they float, you get to enjoy the excitement of a topwater carp hit. Actually, “hit” may not be the proper word here. What will probably happen is this. You’ll cast the French fry and keep your eye on it. Soon, if you’re fishing a good carp lake, you’ll see a pair of big rubbery lips sticking out of the water nearby, and those lips will keep moving closer until they have engulfed the fry. This is the point where you set the hook. But be aware, if you set the hook on a short line, you could have a carp in your lap (or worse) almost instantaneously. The carp almost surely will jump as soon as it feels the hook’s sting, and it will jump several times before you land it … if you manage to land it at all. 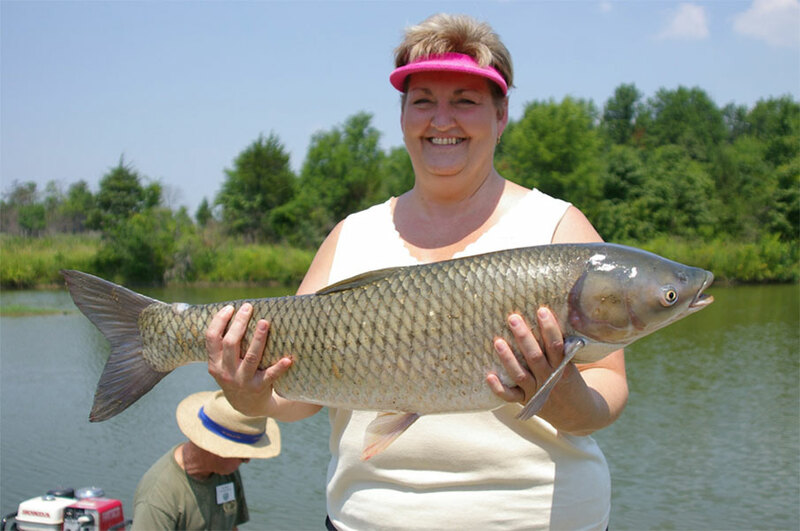 The biggest grass carp caught on rod-and-reel was an 87-pounder caught in Bulgaria in 2009. I predict, however, this record will someday soon be broken as grass carp are known to reach weights exceeding 110 pounds. Early grass carp introductions were controversial from the get-go. Some claimed they were needed to control vegetation, providing a natural alternative to costly chemical and mechanical controls. Grass carp opponents saw nothing “natural” about importing an Oriental fish and releasing it to become a 50-pound intruder gobbling up bass habitat. The controversy continues. Some states allow stocking sterile fish produced in hatcheries; a few outlaw grass carp completely. Amurs offer a trouble-free, ongoing method of weed control when stocked at the conservative rates recommended by fisheries biologists. But when weeds are in check, biologists recommend reducing by at least 50 percent the number of grass carp in a pond or lake. That’s where fishermen come in. Take a lawn mower to your chosen carp lake (if the owner and law will permit it) and mow a strip of grass along the edge. The mower should be positioned so the grass clippings spray into the lake. Now, take a small bundle of green grass and attach it to a hook with a little rubber band. If you prefer, you can create a little “grass fly” and use it with a fly rod. When carp start coming up to eat the grass (if they are present, they most certainly will), cast this lure/bait amongst all those big rubbery lips and get ready to do battle. Fishing for grass carp in this manner is great fun. I say that from experience, having caught two 17-pounders one day while casting plugs of Bermuda sod in a private lake. In my opinion, however, catching white amurs on rod and reel can never compare with the obscure sport of carp baseball. Few methods of fishing are as challenging, exciting and dangerous—and, some might say, idiotic. A little or lot, the man who hits a grass carp grand slam deserves all the respect he can muster.